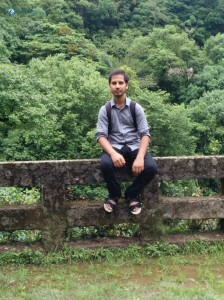 It was a Saturday morning on 21st June, 2014 and it was my first hiking since I joined Deerwalk Inc. as an Intern along with my friends from college. 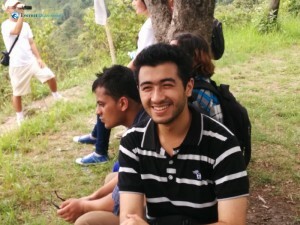 The hiking expedition from Budhanilkantha to Sundarijal was arranged for the Interns and Trainees at Deerwalk under the leadership of Sandeep Neupane Dai. 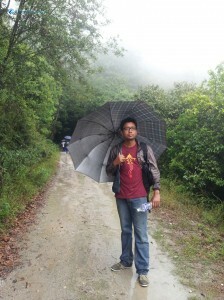 The day was cloudy and gloomy so I packed my umbrella and reached the Deerwalk office which was our pickup point. 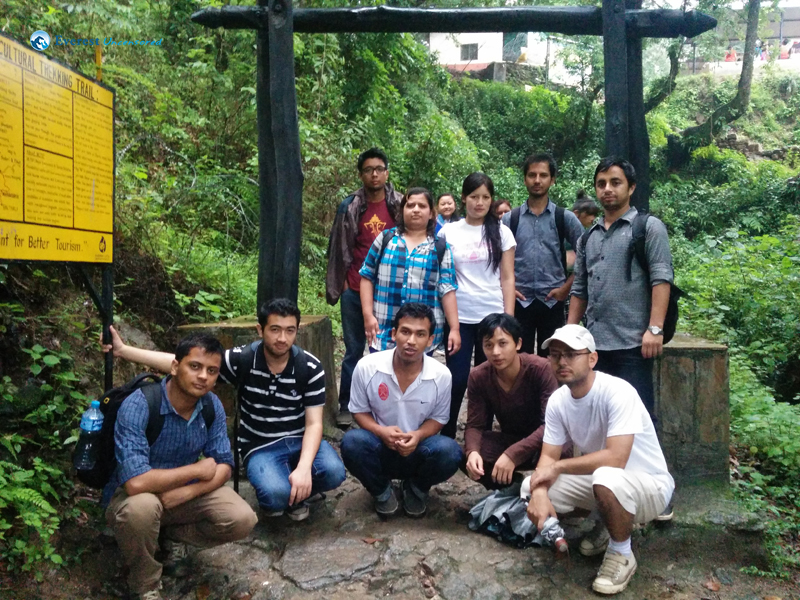 It was around 7:30 AM that we left the Deerwalk premises to reach our starting point of the hike, Budhanilkantha temple. On the way Sandeep dai briefed us about the hike and about these kinds of hikes organized by Deerwalk as it was the first time for the most of us. We stopped by at the Bhatbhateni Supermarket to stack up some supplies needed for the hike and along the bumpy road of Maharajganj we introduced ourselves to one another. 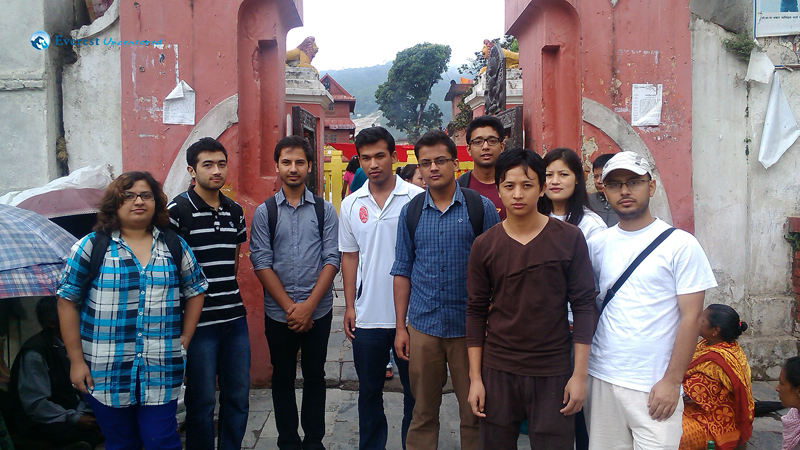 We reached Budhanikantha at around 8:15 AM and had a short visit of the temple. Then we had our breakfast in a nearby café-like place. At around 9 AM, we started walking towards our destination. 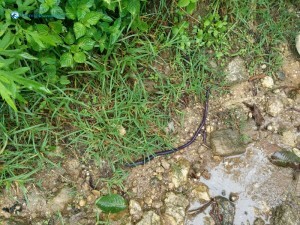 We started off along the black top road and headed towards muddy roads. On our way we asked some passersbys and local residents for directions. After walking for quite a few minutes we could see a number hills up ahead which we were going to climb. 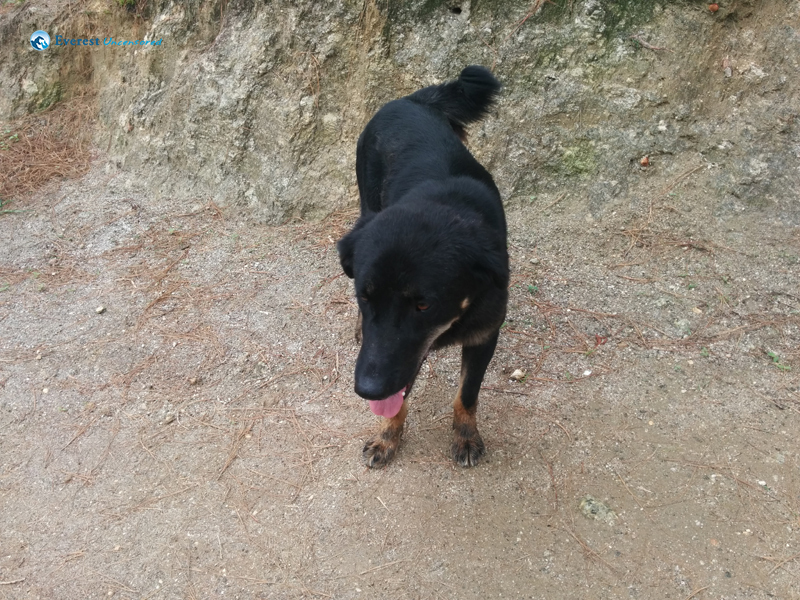 As we started to gain some altitude we were followed by an unlikely companion, a dog, who accompanied us to some distance. 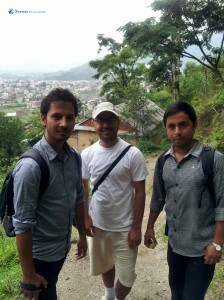 As we walked up the steep hills, we occasionally stopped from time to time to click photos and take short video clips. 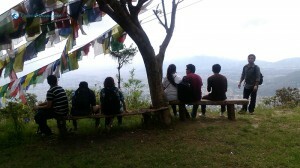 From atop these hills we could see a beautiful view of Kathmandu City surrounded by green hills and approaching clouds. This view was totally worth the climb. After a couple of minutes we reached the road which ran along the hill. 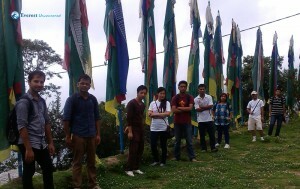 Our first destination was to reach Nang-Kyi gumba. 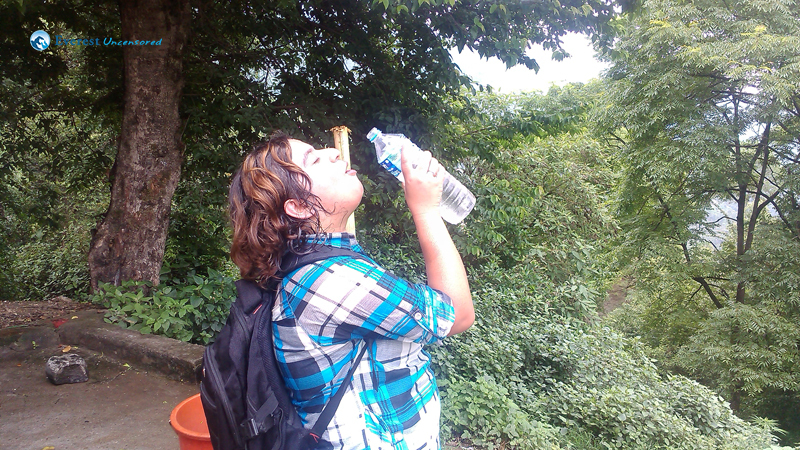 Along the way we refilled our water bottles treated ourselves with chocolates. 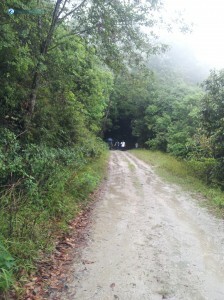 The road to gumba consists of many steep hills and difficult climbs. We finally reached a small house where the Lamas lived; whom we didn’t actually get to see. The place was decorated with five colored flag-like clothes. We moved ahead after stopping for a while. After a few minutes of travel we reached the Nang-Kyi gumba. The place was beautiful and worth all the work. There was a new building which was currently under construction which was supposedly meant for students of the gumba. Here we ate the food stuffs we had bought along with the packed leftovers from the breakfast. As we prepared to move towards our next destination it started to rain. So everyone took out their umbrellas and travelled downhill towards Sundarijal. 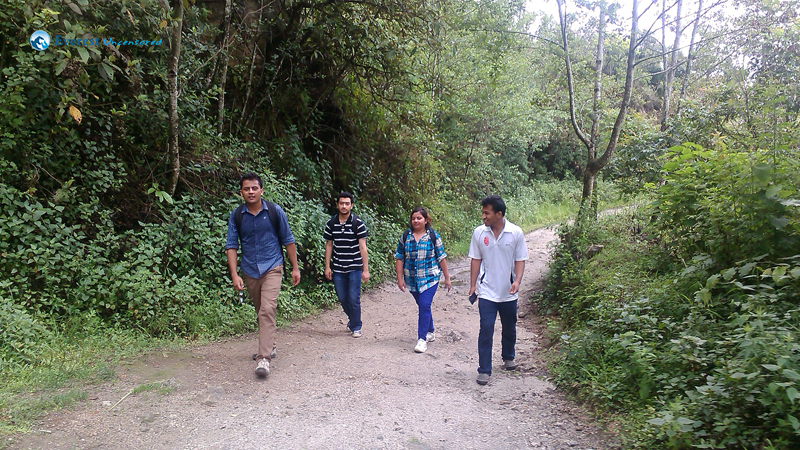 As we travelled towards Sundarijal we met a number of travelers who were travelling uphill from Sundarijal. It was a along walk to Sundarijal. The road was slippery and damp due to rain. 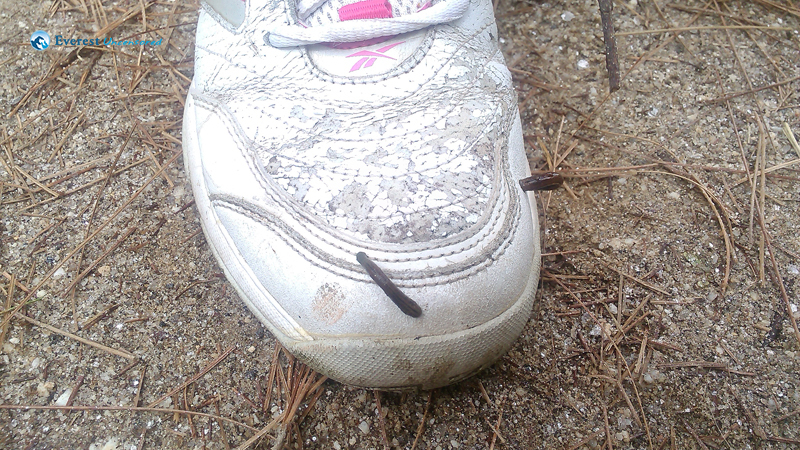 We were warned about the leeches before so we took caution and checked for leech bites periodically. 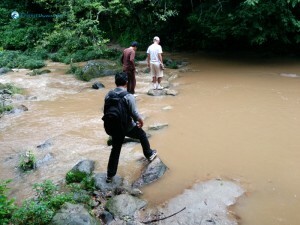 We had to jump across the small puddles a couple of times which added to the fun of the hike. Occasionally we stopped for photos. As the rain was heavy and all of us were really tired we stopped for a while at a small eating place for some tea. 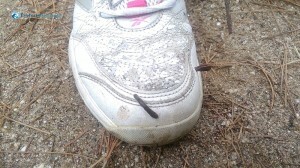 Here we checked for leeches and applied salt on the ones found. Most of us were bitten. After a while the rain stopped. Then we continued our hike. After a few hours of walking we came across Bagmati river. We had to cross it through a few stepping stones. This particular moment was quite adventurous. 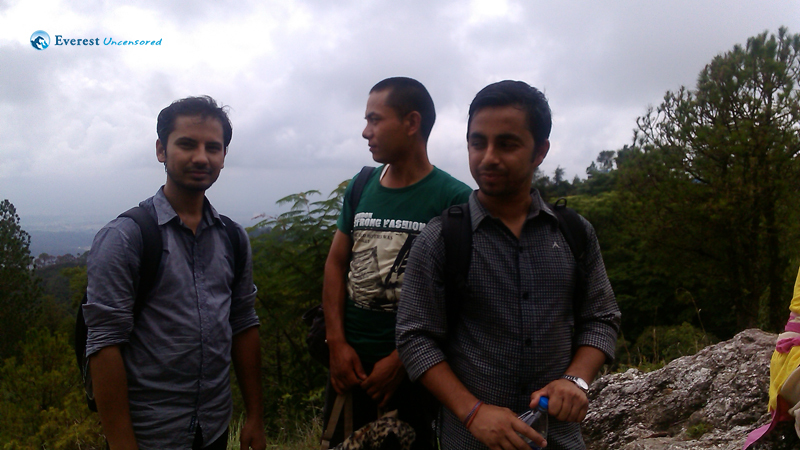 Couple of minutes later we reached the Sundarijal dam. People were swimming near the dam. The waterfall created by the dam was quite marvelous. Along this road we saw a lot of people traveling from the direction we were supposed to reach. 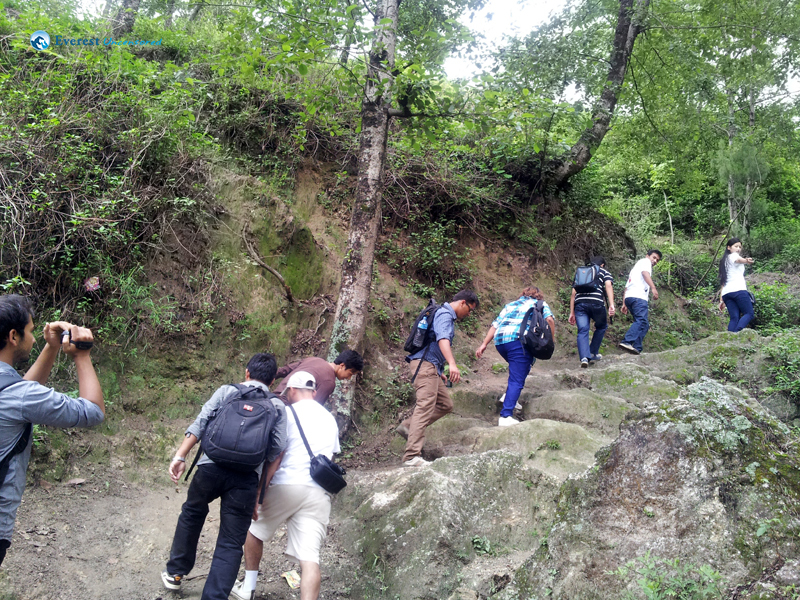 By the time we reached Sundarijal it was already 3:00 PM and most us were tired and our legs were aching bad. 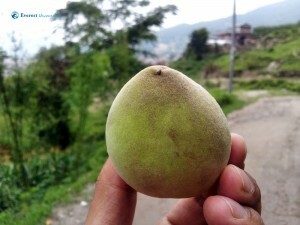 Deepak dai was waiting to pick us at the Sundarijal Gate. The final drag to the pick up point from Sundarijal was particularly difficult. The road was steep and full of medium sized rocks. It had also started to rain again and so the water was also flowing along the rocks which had made the road really slippery. We finally reached the pickup point where the Deerwalk vehicle was waiting for us. 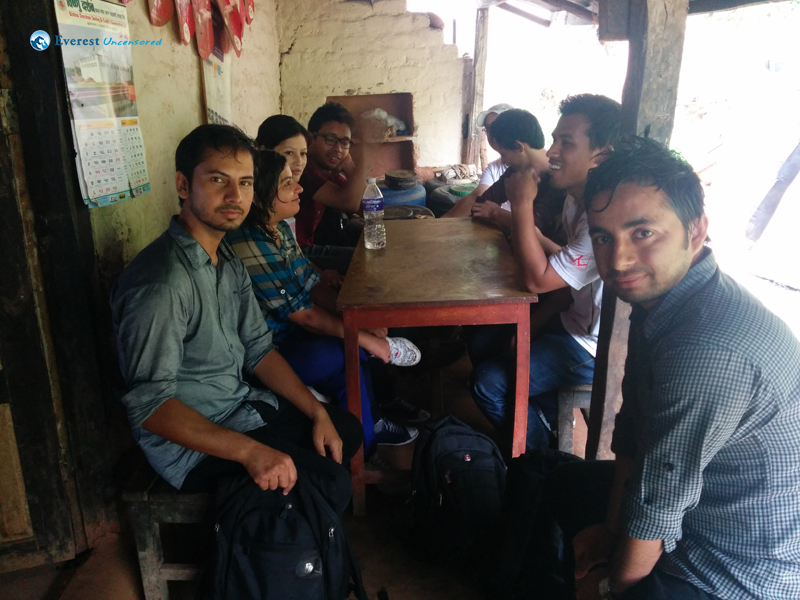 From there we discussed where we wanted to go for lunch and finally decided to go to Sinamangal Thakali Khaza House. The lunch was delicious and satisfying as all of us were really hungry. After lunch we said our goodbyes. The hike officially came to an end. 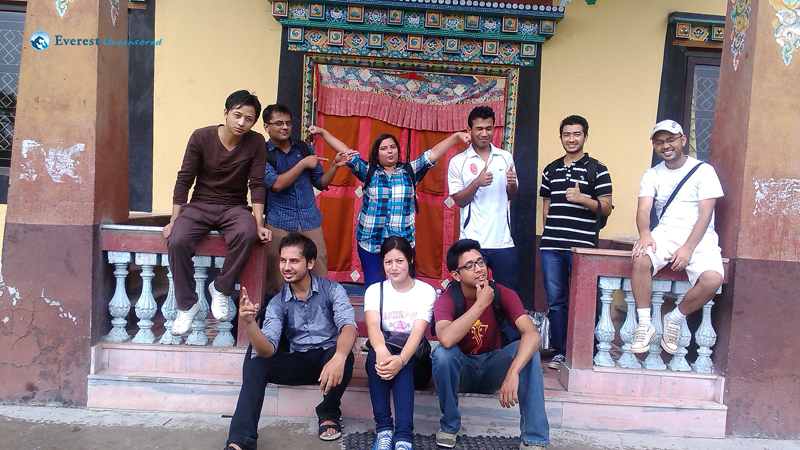 It was an exciting experience which will be remembered for a lifetime. The day was Saturday. Actually, I could not get up early in the morning in spite of the three alarms I had set the previous night after watching the first two games of the World Cup. Hurriedly, I got up at 6:00 AM abiding by the mail time that read sharp 7:00 AM. Actually it was Nepali 7:00 AM. 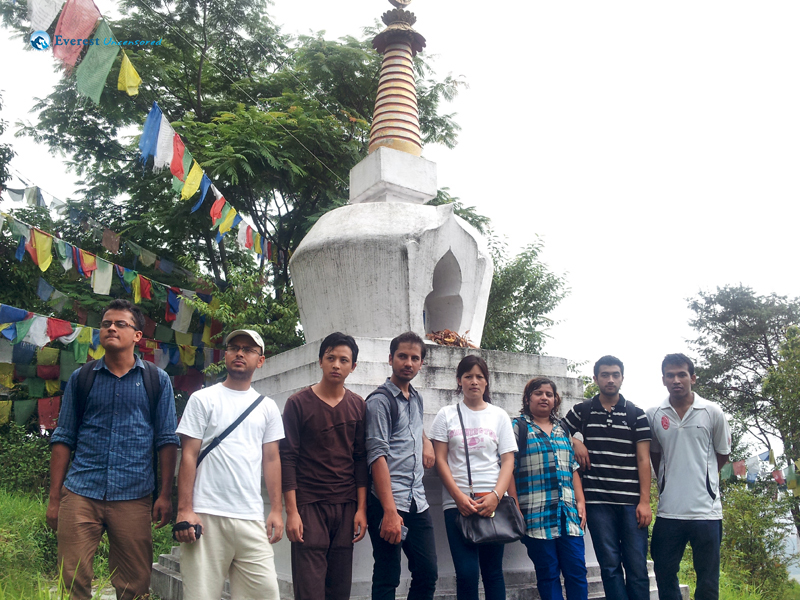 With all the team members gathered, we left Deerwalk for Budhanilkantha around 7:45 AM. We were all introduced to each other as it was a maiden hike of ours. I really was trying to catch the names of our team mates, but wasn’t quite successful. The easy names glued first. A little shopping was done at Bhatbhateni for the supplies and fuel energy (Chips, Chocolates and of course Drinking water) on the way. 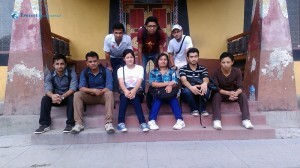 Entering the holy temple of Lord Bishnu at Budhanilkantha, we gave a short worship and had our breakfast. 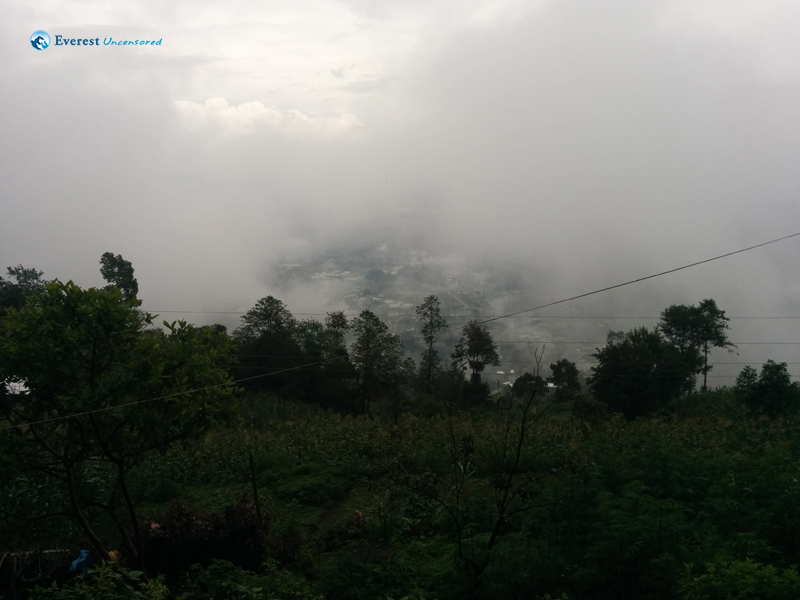 Hot Samosas, Jerry and tea was the fuel to propel our journey through the high hills of Shivapuri. The walk started around 9:00 AM along the small locale around Buddhanilkantha, which went on being sparse as we moved north. 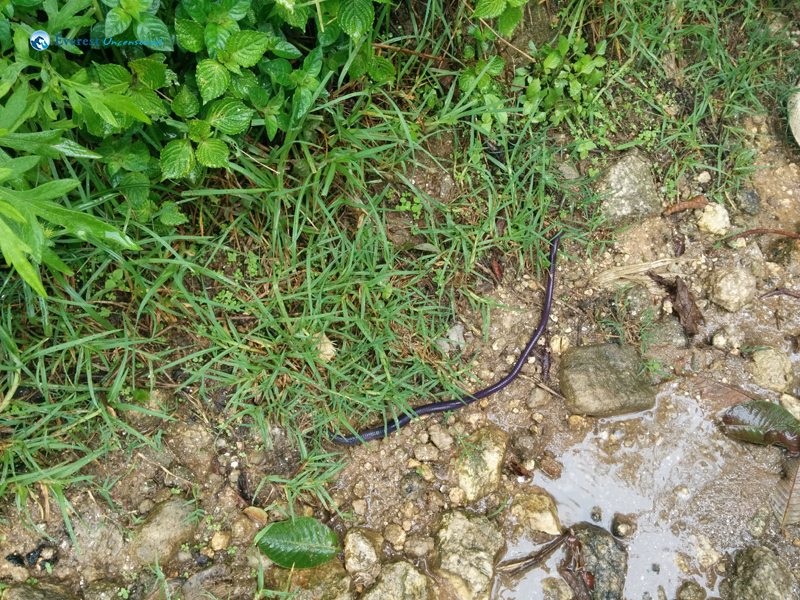 We were all discussing about the “Jukas(leeches)” and rainfall that we may encounter during our way. 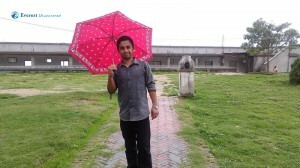 The climate was cool, hovered with black clouds and may be the sky also indicated a warm Hug and said “Well done Guys! It’s a great day for a Hike”. However the clemency of the weather could be foreseen and we were also backed up with Umbrellas in case the Sky changed its mood. We moved uphill and were accompanying a couple who were ahead of us. We kept on asking about the total journey time to the destination. 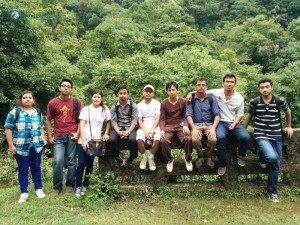 The man detailed us about the place, his village, the way to Nang-Kyi Gumba and then to Sundarijal. 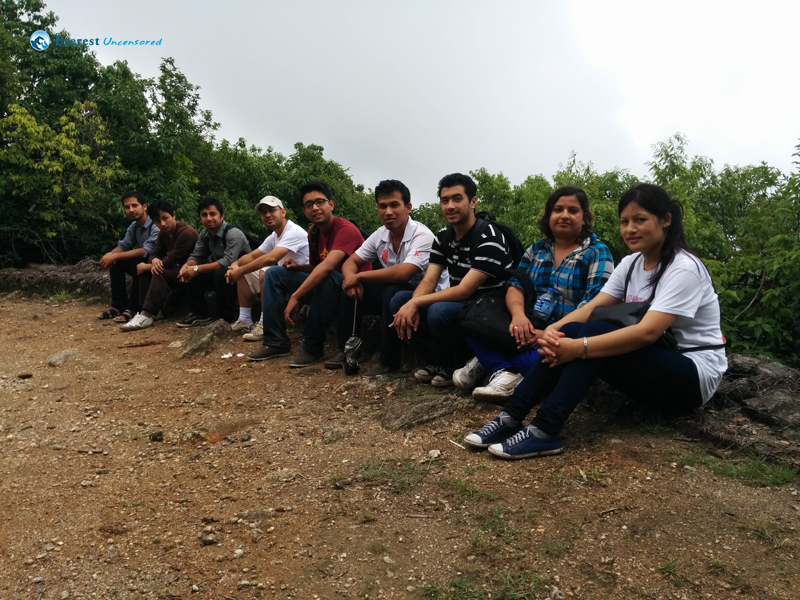 We were naïve about the place and thought we can easily conquer the Shivapuri hills in no time. The bug started there. The total hike was rounded off to 3 hours in the mail, actually it took seven. 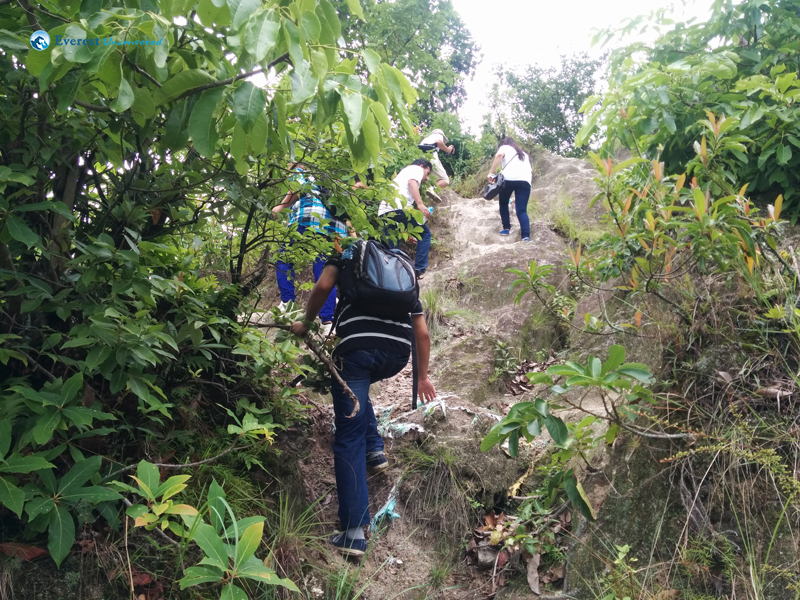 Talking, whispering and laughing, we were climbing the hills to Nang-Kyi Gumba that was almost 2 to 2.5 hours walk from the Budhanilkantha foothills. Within no matter of time, we were diagnosed with fatigue and exhaustion going uphill, against the Earth’s gravity. But the weather, the surroundings and the greenery of the hills soon flooded away our fatigue. We became enthralled with the beauty of the nature, and thought that Nepal is really “Gifted”. Taking photos and chewing some gums, we moved to the village nearby the Tarebhir. Some of us even guessed the origin of its name- Tarebhir. What a steep cliff it was. Hmm, true to its name. 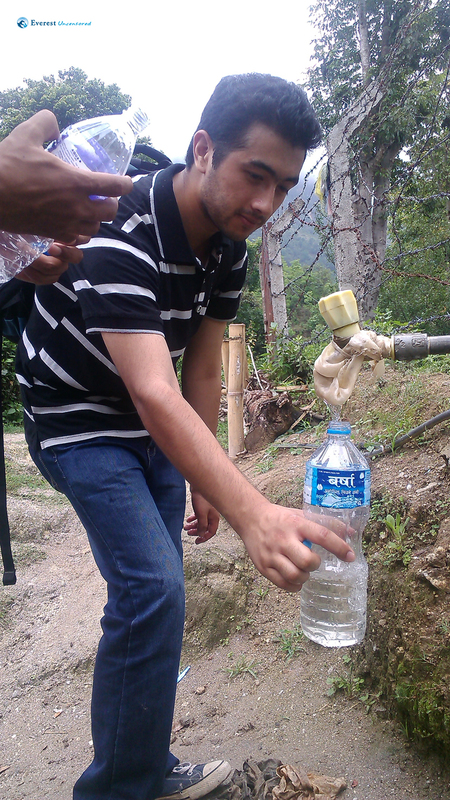 We watered ourselves and filled some in our bottles and clicked the panorama of the concrete Kathmandu. The small raindrops falling warned us: Come on, Hurry up Guys! 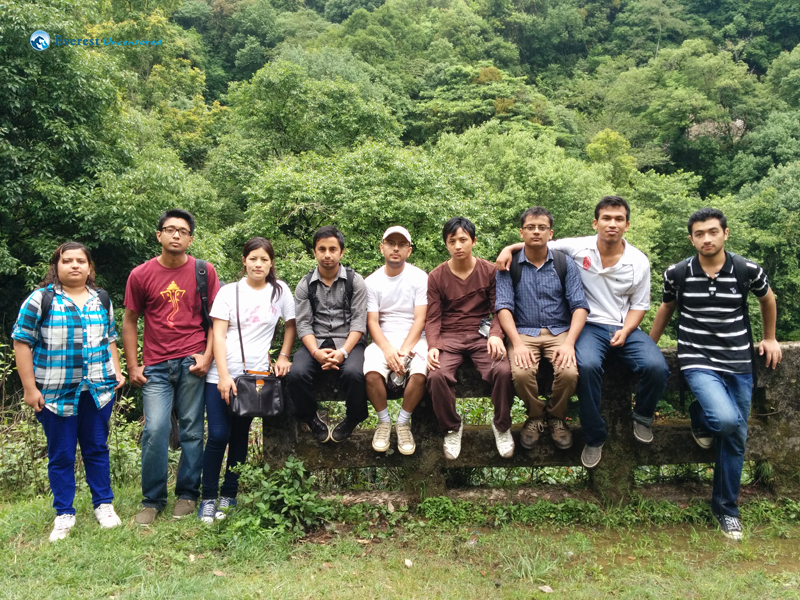 So, we accelerated our steps uphill to a small house where the Lamas lived, near the Nang-Kyi Gumba, where we took some group photos and reached Nang-Kyi Gumba around 11:00 AM. Truly natural, splendor and magnificent, the place was a hub of some Lamas, who lived nearby and preached Buddha’s teachings. “What a place to meditate”, I thought. Really Buddha was the One to show the path to Salvation and his followers are truly idyllic. 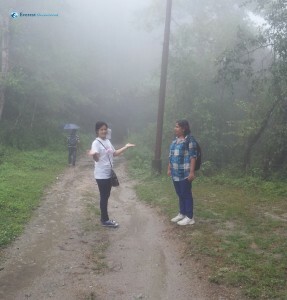 The rain smiled back upon us and soon the Gumba was covered with torrential rain and foggy weather. The place was truly majestic and seeing such places in such cool weather, covering with heavy fog, is really a lucky day I guess. 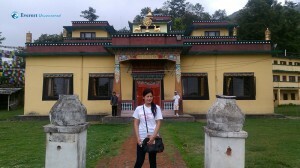 We had some chips and snacks, paid a visit to the monastery and left for Sundarijal in the downpour. 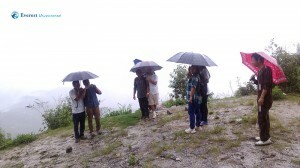 Pairing ourselves in the canopy of the umbrellas, we enjoyed the rain as we moved on. Coldness and chilliness was rushing within us, so to circumvent the challenge of the rain, we stopped by a small tea shop to warm ourselves after a while. In between our way, we were confused in the junctions, but were successful by choosing the wider path. After crossing a small village and the Army Camp, it was an utter dark forest area, something like a horror movie shooting place. We moved on with our steps, eyeing on our watches and calculating the time we travelled. 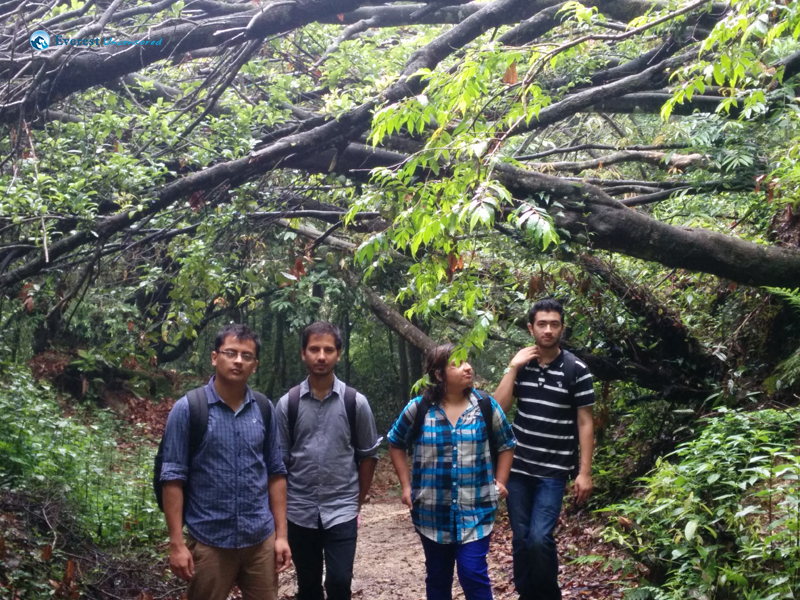 After 5 hours of our travel, we were in the middle of the Shivapuri jungle. 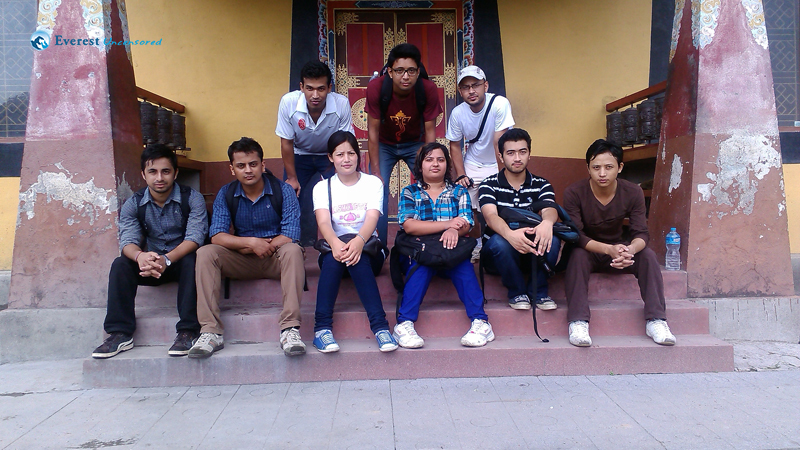 Most of us had been exhausted without lunch and expecting to reach our destination soon. 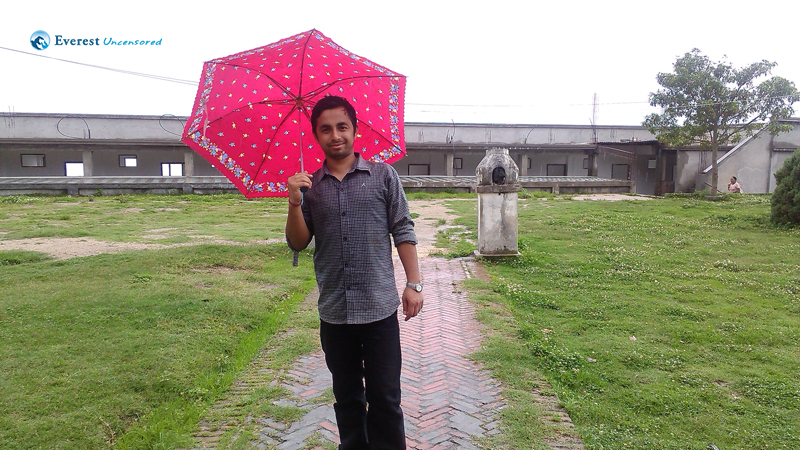 The rain had stopped and the sky was clear, without sunshine. The lush vegetation in the forest and nearby downhill were worthy of a sight. I felt the day was lucky for us, or were we the lucky ones? 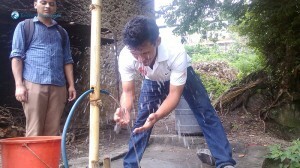 We went on with our mundane chores and talk, taking photos, cracking jokes and blaming the watch for its slow timing. 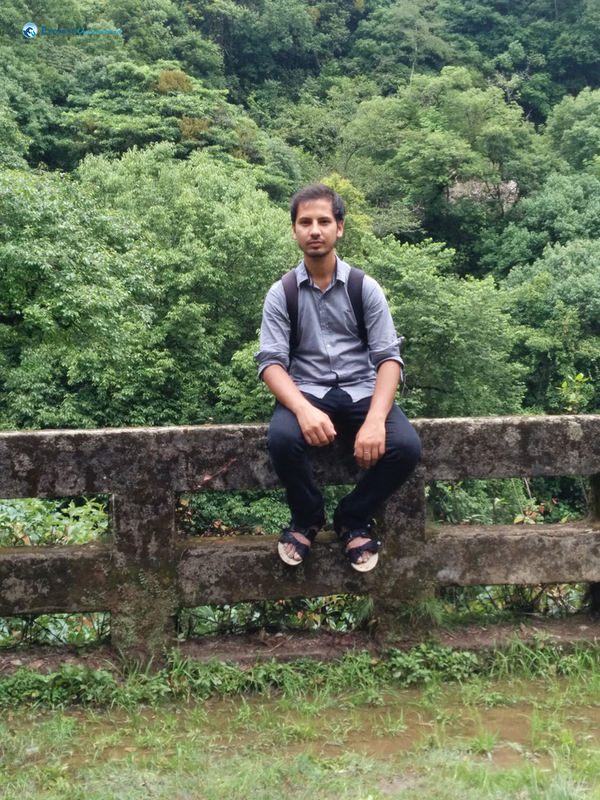 Within more 2 hours we reached a bridge that I recall informing by the tea shopkeeper. We were excited, that we were near. And, yes we were. Then we reached Sundarijal Muhaan, the origin of Bagmati River. 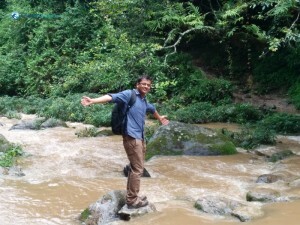 And the most important of all, we crossed Bagmati without a bridge. And I mean it. We crossed it with the stones laid on. It was really exciting. 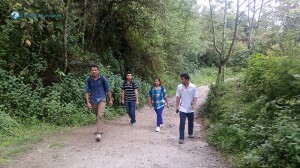 Then, in 30 minutes, we reached Sundarijal, visited the hydropower dam. 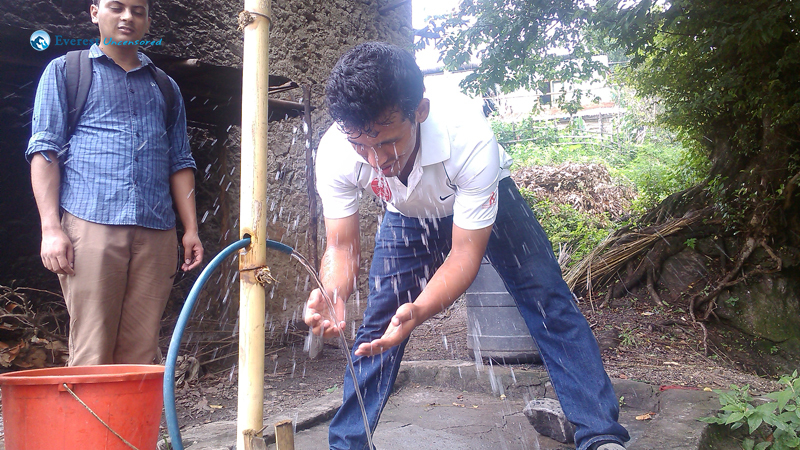 Actually it is the second of its kind after Pharping Hyropower Project. The waterfall was worthy of a snap, and we folks, didn’t missed it either. Many people had gathered for picnic and outings as it was a Saturday and some were seen bathing and having fun in the nearby streams. 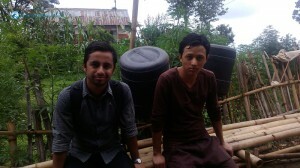 We had called Deepak dai earlier and he also had climbed 25 minutes uphill to receive us. Lucky We, I guess. No, actually not lucky, all exhausted, tired and gloomy: and above all it was around 4:00 PM without lunch. 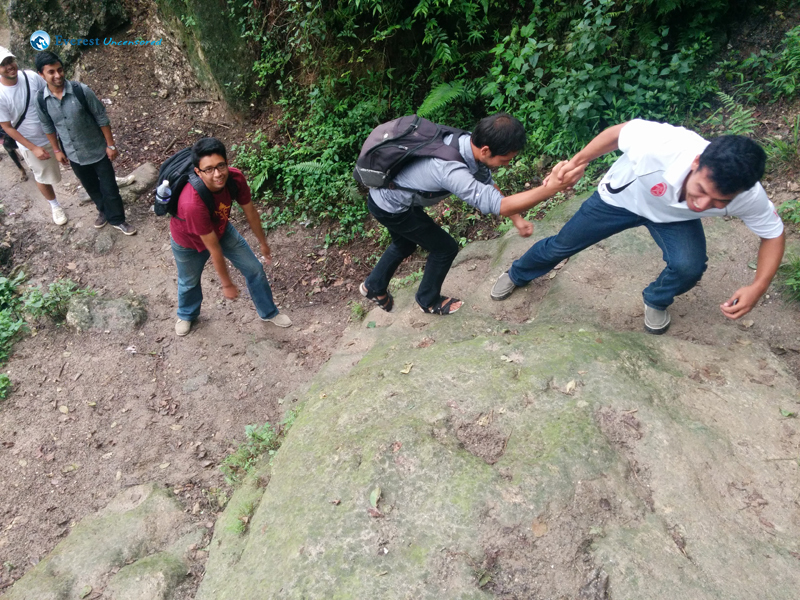 Slowly and steadily we climbed down the Sundarijal Gate. 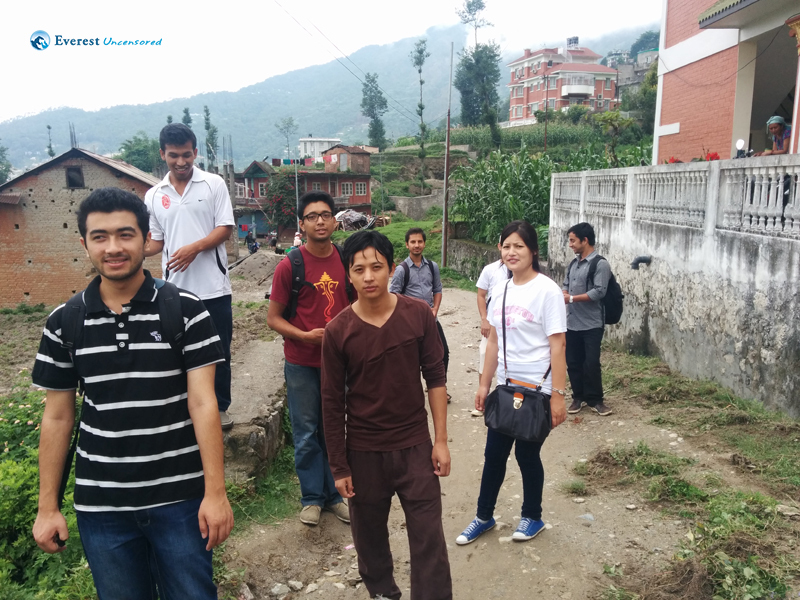 We were all exhausted even to reach the office the vehicle when we reached the Sundarijal bus stop. But, we had to go. All the seven hours of walk in the rain and pain had slaughtered us. After moving into the vehicle and having a seat, I bet, it was a heavenly ride. 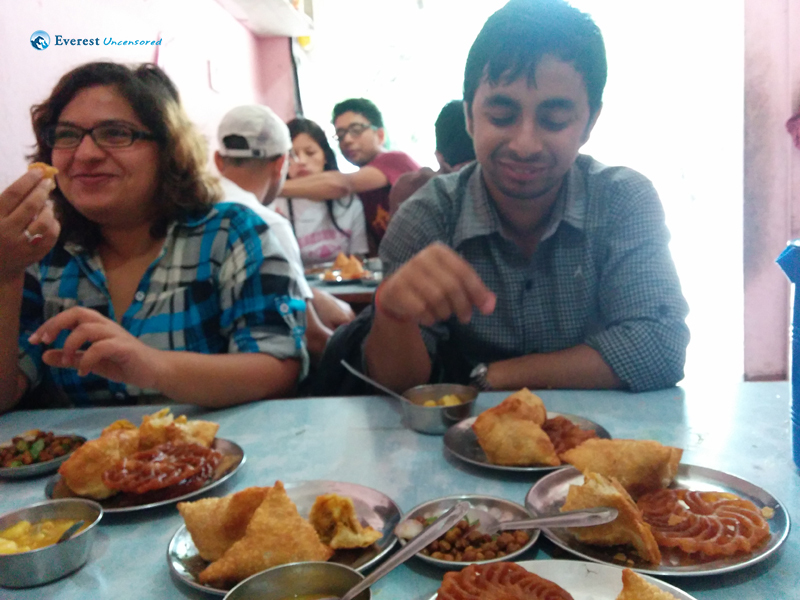 Then we moved to a Thakali Restaurant at Sinamangal and fed ourselves voraciously. Yummy, the food was next to Ambrosia. The food was marvelous for the “We Hungry People”. 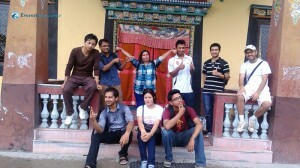 After taking some rest, we parted to our respective destinations. It was my first hike from Deerwalk and was worthy of a ride. 34. O Captain! My Captain!